Steaming is cooking food with moist heat. Food to be steamed can be placed directly on the steamer rack or steamer basket (lined or unlined), on a heatproof plate or in a heatproof bowl. Make sure the plate or bowl used is at least ½ inch smaller (all around) than the steamer tier to allow for free movement of the steam. The steam must reach the food in order for it to cook. Water in the steamer base should not touch the food being steamed. The surface of the water should be at least 1 inch, preferably 2 inches, away from the bottom of the steamer rack or the dish being used. If the steamer base cannot hold the correct depth of water to cook the food for the required time, have a kettle of boiling water ready to replenish when water gets low. You will, however, need to increase the cooking time by a few minutes each you open the steamer. 1. Add water to steamer base (this can be a wok, pot, frying pan or the base that comes with a steamer set) and bring to boil using high heat. 2. Place food in steamer basket or on steamer rack. 3. Steam as per recipe’s instructions. Using a bamboo steamer basket set in a wok or a pot (the basket should sit snugly on top of the pot). Food can be placed directly on bamboo slats, however, I prefer to line with lettuce, napa cabbage, damp kitchen towel or cheesecloth. Place a rack in a frying pan (with a dome lid) or 3 small can (both ends removed) or a wok ring in a pot and place heatproof plate, bowl or steamer rack on top. 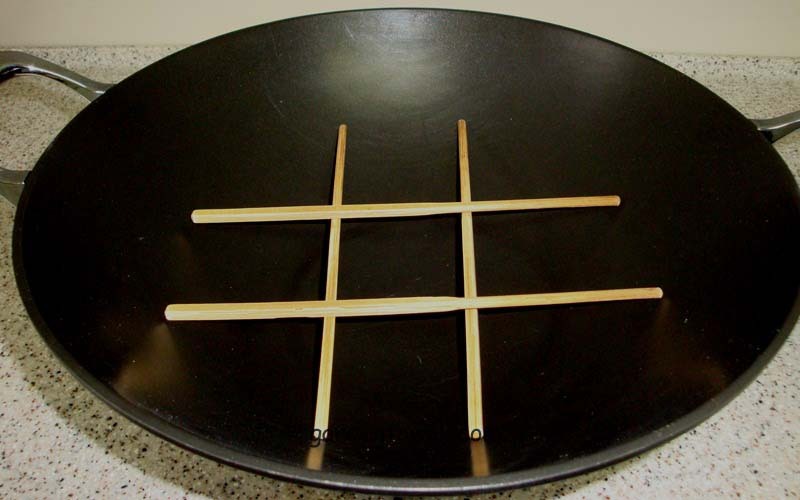 Place 4 chopsticks tic tac toe pattern in a wok or a perforated steamer rack and place heatproof plate or bowl on top. Plate or bowl on rack must be smaller in diameter than the wok, frying pan or pot. Left a wok ring, right a perforated steamer rack. You can make a perforated steamer rack using a pizza pan. Before using your brand new bamboo steamer. 1. Scrub well with a mild detergent and rinse thoroughly. 2. Soak in clean hot water for 30 minutes. 3. Steam, empty, for 30 minutes to get rid of the bamboo smell and taste. 4. Allow to fully air dry before storing. After this initial treatment all you need to do after each use is to wash in hot water and allow to fully air dry before storing (will get moldy if not fully air dry). I keep the cover of mine at an angle to allow for air circulation and to prevent mold. Thanks and you are welcome. Thanks for stopping by my blog. I don’t know how I missed this, Norma, but it is a wonderful post for us steaming-neophytes. Thank you for writing and sharing it with us. Thanks and you are welcome. Glad you liked the post. Glad you found the post informative and thanks for the linked up. Sorry it took me so long to reply to your comment (was under the weather), do you still have a photo of the “very unique ornamental Chinese cabbage”? Please send it and hopefully I will be able to identify it for you. Hello, Norma! I’m visiting from Bam’s Kitchen today. Thank you for taking the time to educate us all on using the steaming method. I’d really love to use one of the steamer baskets and plan to add it to my kitchen soon. Thank you for the tips on cleaning/storing. Thanks for visiting, sorry it took me so long to extend my welcome, was under the weather. Glad you found my post useful, Looking forward to your future visits. great tips! Especially the one using chopsticks. Thanks, glad you like my tips. Just got my first bamboo steamer for Christmas. Still waiting on the adapter ring and accessories to come in. Looking forward to using it. 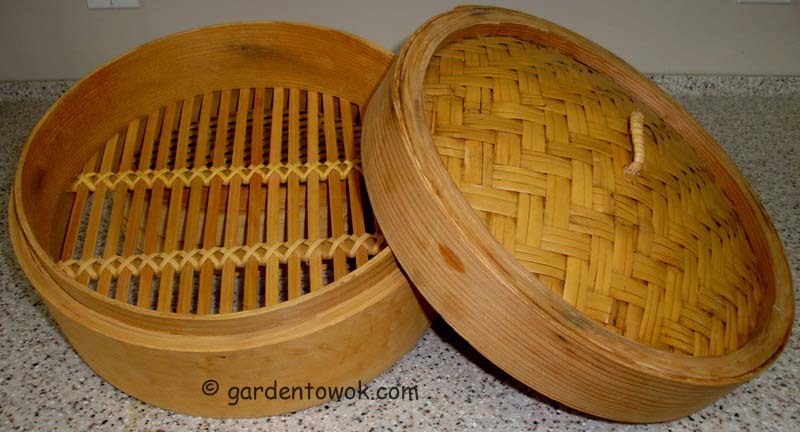 So glad I read your post about how to first take care of bamboo steamer. Thank you for helping us take care of this wonderful product. Thanks for stopping by and sorry for the long delay in replying to your comment, was under the weather much too long.Glad my post helped do write again if I can be of further help or if you have any questions. Thanks for sharing tricks. I get more ideas from it. I want to buy this wok for survival cooking. Thank you, Norma! LOVE the chopsticks in the wok!